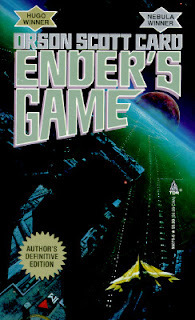 In honor of the movie being released in less than a year I will be reviewing the book, Ender's Game. Seemingly taking place is a post apocalyptic future Ender Wiggin is a super intelligent child who must save the world. Planet Earth has been devastated by an invasion of 'buggers'. Buggers are insect like aliens from a distant planet. In order to help preserve life on Earth the search is on for a command leader intelligent enough to design a battle strategy to would defeat the buggers. In a school full of child geniuses Ender is the smartest. Ender is chosen above all others, including his siblings, to attend Battle School. Battle School is a lot like it sounds, it is a futuristic school to teach the most intelligent of children how to wage war. At Battle School, Ender meets some people that are crucial to his future. I do not want to give away too much of the story, I merely wanted to set it up. This book is skillfully composed and has a unique twist. The book has multiple focuses including politics, war, and life as a young child. Ender's Game is especially rewarding if you are someone who has experienced bullying. If you are interested in sci-fi, this is a must read. 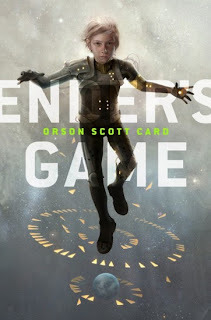 As further evidence to its popularity, Ender's Game was made into a graphic novel series. There are a number of sequels to this book. Some sequels were written by the original author Orson Scott Card and some were not. I can not wait for the movie and I am especially excited to see Harrison Ford as Colonel Graff. Overall I would give the book a 7.0 out of 10. If I read this book at a younger age my review would probably have been higher. My final thought is did the Battle School 'desks' spark the idea for a tablet computer?